← Spooky Ghost “The Palace” Video at over 100K views ! Happy and Spooky New Year to you all. 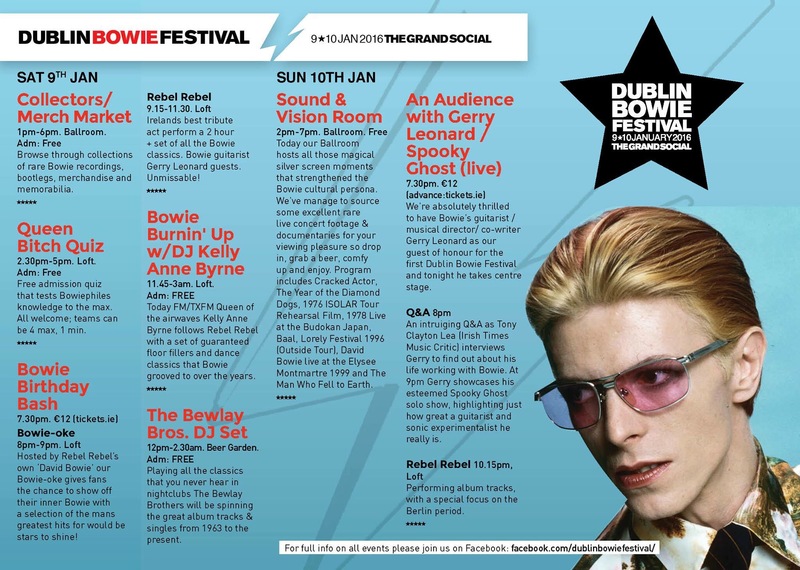 The nice people at the Dublin Bowie Festival in Ireland have asked me to be their guest of honor this weekend as they gather for a celebration of all things Bowie and the release of David’s new Blackstar record. I will be sitting in on Saturday night (Jan 9) with Rebel Rebel , the house band for a few tunes. On Sunday Jan 10 I will do a Q&A session with Tony Clayton Lea ( Irish Times music critic) and then go on to perform a solo Spooky Ghost set. It all takes place at the Grand Social Club in Dublin. I will also be on RTE radio and Today FM radio. So watch out ! This entry was posted in News and tagged Blackstar, David Bowie, Dublin Bowie Festival, Gerry Leonard, Spooky Ghost. Bookmark the permalink.